A casual walk inside Intramuros like seeing the old walls and churches there I thought is enough to fill Annie’s curiosity, a Canadian tourist whom I met thru Couch Surfing of what we Filipinos were before. 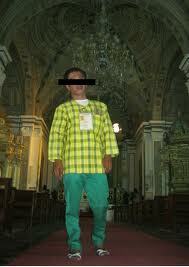 But as soon as we walked near Manila Cathedral all the researches I did a night ago about its history was forgotten! I just blurted out “Oh, a famous tour guide and authority of Manila’s history once held a protest here, dressed in our national hero’s attire, flashed a placard with a Damaso name on it while there is a mass going on. ” She gave me a blank stare. “He spent a night in a jail after.” I received another blank stare. Just in front of Manila Cathedral, I led her to Plaza De Roma. Again, the reviews online I read about this, all gone in the air. A forty-something, petite man suddenly approached us and offered to walk us through the historical places, of course with a pay. He said an amount at first which we thought it’s expensive and we quickly said “No”. He slashed the price half, we quickly said “Yes”. But how can this be a tour guide when his wearing a white shirt and shorts? Then he opened a crumpled plastic bag, took a dress out that looks old and shook it. The next thing we knew, he’s putting on this green, flashy dress in front of us that he later said their official uniform as tour guides! I was laughing my heart out and so did Annie. We went out and while walking a group of Japanese students are just in front of us and their tour guide is also Japanese. So I asked “Oh, so there’s a foreign tour guide here too?” He replied. “Yeah, they come here to take a lesson and be a tour guide to their fellow countrymen who visits here. “ “I see.” I said. “If I finished my studies, maybe you won’t see me here today. ” He said in Filipino. I then told Annie in English what he said and noticed his funny face became sad, his eyes a bit watery. I got tongue-tied. My heart was pinched! Annie and I went separate ways. We thanked each other. I hope it was a great experience for her. She said she will upload the photos by first week of February since she will tour a few islands in the country for the next 2 weeks or so. I can hardly wait. Then I remember the tour guide, he didn’t know there’s one person that envies him so much… it’s me. My work has imprisoned me for several years already that almost it’s impossible to make a vacation longer than three days. What would happen to this guy and the rest who makes a living out of Intramuros and Fort Santiago which is said to be on the verge of irreparable loss and destruction? Curious enough, I took a picture of him while copying his body style on how to take picture and the one above is the result.